Other day,I was looking at the client health dashboard which I published long ago https://gallery.technet.microsoft.com/SCCM-Configmgr-2012-SSRS-2863c240 . From the dashboard report ,noticed that couple of clients were having software update scan issues . So ,the report had couple of clients with software update scan failures with lasterrorcode –2147012894 which leads to me take a look at one client (XXXXXXX) and see what's happening on that. If you want to see, how your clients are performing software update scan (without dashboard) ,run the below SQL query in management studio. This query will help you to get list of client that have issues with software update scan (software update scan not success). Login to the problem client (it can be workstation or server ) ,open WUAHandler.log located in C:\widows\ccm\logs ,notice the below error. OnSearchComplete - Failed to end search job. Error = 0x80072ee2. Scan failed with error = 0x80072ee2. This log has several entries related to proxy request ,send and download file failed etc. Problematic Client is healthy and able to send inventory and receive other deployments like applications etc but software update scan is failing all the time. if you look at the above log snippet, it is failing to download the cab files from WSUS server . It looks like ,client has some issues downloading the content ,so how do I check what is causing the problem for content download ? From Windowsupdate.log snippet, client is trying to access the URL http://SCCMServerName.domain:8530/ClientWebService/WusServerVersion.xml which is failed due to proxy settings. From other working client, found the below URL succeeded but not on the problem client ,so I ran the below URL on non-working client and it surely have issues with proxy. How do I fix the proxy issues on the problem client and get the rid of software update scan issues ? There is a registry key on the client machine which you will have to change to get it working. What is the registry ? Save it on desktop ,copy it to the problematic client and run it (double click on it ). Once the registry key is imported ,Open services.msc from RUN command ,restart windows update service. After few min ,I noticed that, scan still failed with error code ,but this time it is different : OnSearchComplete - Failed to end search job. Error = 0x80244010. 0x80244010.—> The number of round trips to the server exceeded the maximum limit. After a while ,it will try (you don’t have to do any) again to sync and sync will get Successfully completed . Now go back to your site server ,run the SQL query ,you will see problematic client will no longer appear. login to the working client ,export the registry key ,import into the problem client ,restart windows update service ,wait for a while ,monitor the logs. 8 Responses to "SCCM Configmgr software update scan failed OnSearchComplete – Failed to end search job Error 0x80072ee2"
are you able to browse to WSUS URL as said in the blog post ? did you try importing the reg key from working machine to non-working machines ? Try to initiate software updates scan and see what happens. If the website you encountered error with is successfully launching on a client with issue, what can be the further steps to resolve error 80072ee2? 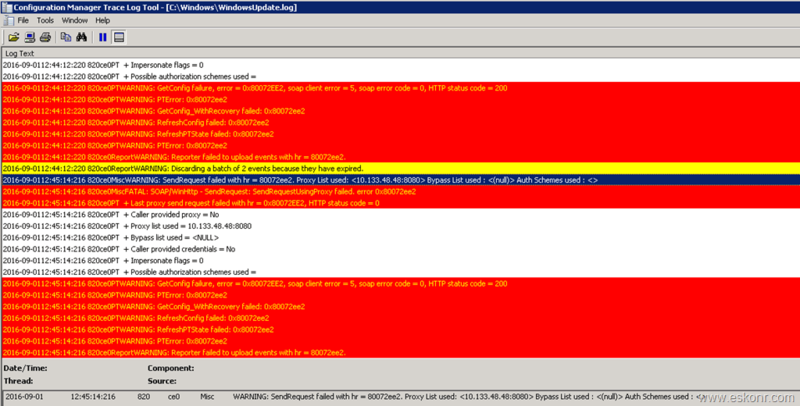 Did you restart SMS agent host service ,ran software update scan cycle ,wait for few min and then monitor the logs ? If you are able to browse to URL from client what i said in the log,am sure it works fine . try to initiate software update scan,monitor windowsupdate.log and wuahalnder.log for further results. Sorry to dig this thread again live. Recently we configured a new WSUS Server by Shutting down our old Windows Server 2008 R2 WSUS server as we migrated our Primary Site to Windows Server 2016 and there were SDK compatibility issues. After new WSUS Configuration Scanning from all clients is very slow. It has now been 4days since the Complete Sync and WSUS DB upgrade completed yet~2.5K clients are still ending up with the same 0x80072EE2 error in WUAHandler.log. SoftwareDistribution .log in the WSUS folder has the below error endlessly. I guess the scanning completion for all clients is slow but how to overcome this error and ensure all clients receive the patches without issues. Have same problem , tried the steps mentioned by you . the url works fine on both the computers ( problematic and non problematic). but still getting the failed software scan error. can you also do telnet to wsus server if that works or not ? if this did not solve the issue then must review logs further.